We present a review of the existing research on instructive feedback. Instructive feedback is a method of presenting extra, non-target stimuli in the consequent events of instructional trials (e.g., during praise statements). Students are not required to respond to those additional stimuli and are not reinforced if they do. 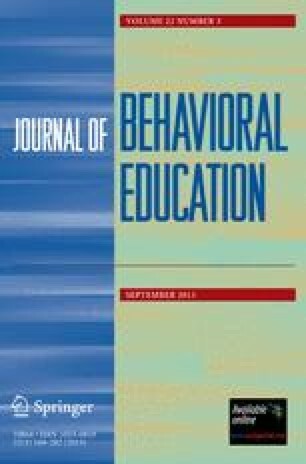 The research is reviewed in terms of the characteristics of participants involved, the settings and instructional variables used, and the findings that emerged. The findings indicate that a wide range of students by age and disability were included and that most studies occurred in special education contexts. When used with response prompting procedures in a variety of direct instructional arrangements, students acquire and maintain some of the instructive feedback stimuli. Thus, teachers are encouraged to use instructive feedback in their direct instructional activities. Areas of future research include using instructive feedback in new contexts and examining methods for presenting instructive feedback. In addition, the use of instructive feedback to influence future learning and stimulus class formation should be investigated.